As an artist who often uses objects from the past as a metaphor, Christine Turner found an ample supply of inspiration in the eclectic collection at Mavis Bank. The essentially personal and domestic nature of the collection fitted well with the recurrent ‘domestic goddess’ themes in Christine’s previous work. Her work in the Collective Insites group exhibition explored the intersection between the private and public faces of women and between the reality and the dream. Objects of household drudgery from the Mavis Bank collection were juxtaposed with symbols of refinement and romanticized notions of womanhood. Her transformation of machines from the Mavis Bank collection reminds us of the meaning we find in objects from the past. Their inclusion in an art gallery exhibition, transformed by the artist raises our perceptions of these objects from mere curiosities with long gone practical uses to symbols of wider and more esoteric stories. An old copper filled with doilies standing in a pool of laces highlighted the essential conflict between the reality of hard work and practicality with the refinement of the parlour. 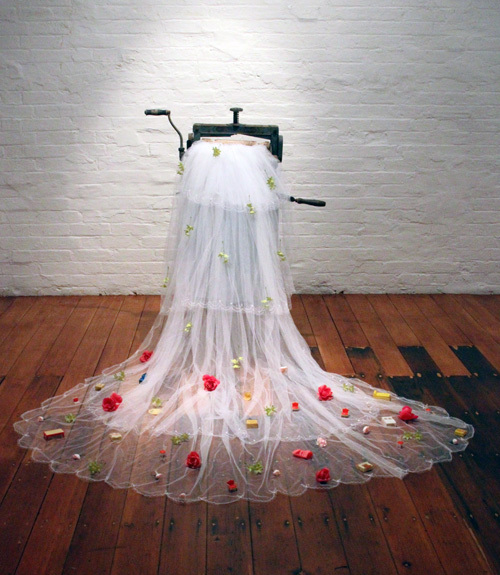 An old washer became a bride like figure with a veil of lace. 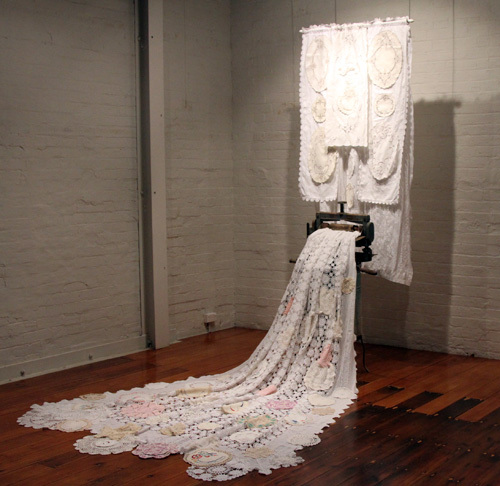 The backdrop hanging of impossibly white, starched lace and linen richly embroidered with the word ‘Mother’ as the centerpiece pointed to yet another idealized notion of womanhood. Indeed, the idea of ‘mother’ is often central to Christine’s work. Christine’s third piece in the group exhibition was a tribute to the collection and its owners. 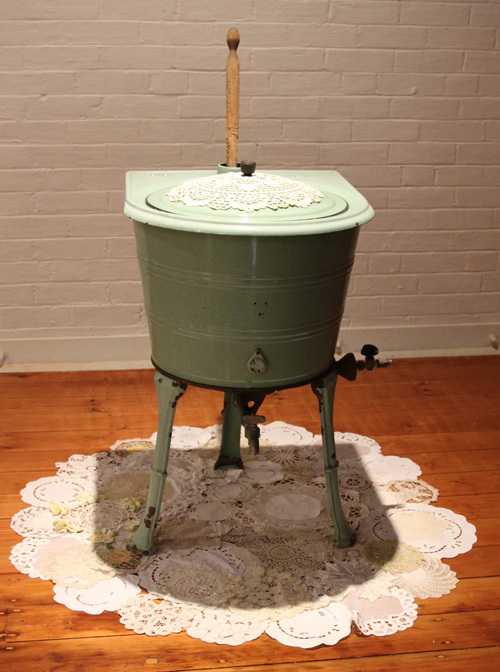 From the beginning of her association with Mavis Bank she had fallen in love with the ancient mangle whose ornate form combined with a practical purpose seemed to embody her domestic goddess theme. 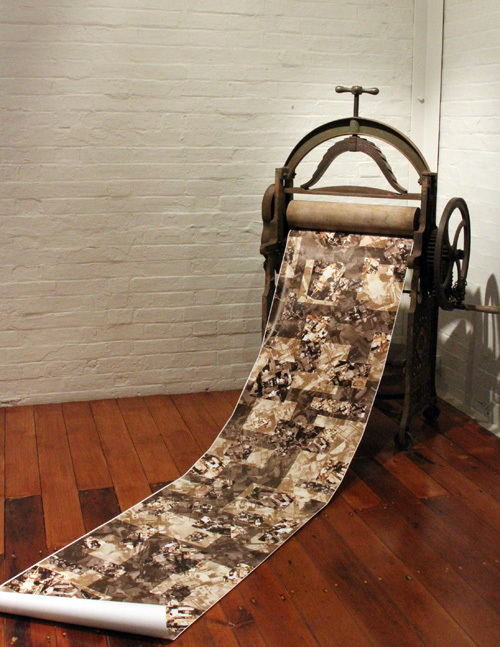 Images of the collection and it’s owners Elizabeth and Patrick have been interwoven into a large scale sepia print that rolls out of the mangle onto the floor. There are allusions to printing processes here, and to the way history is often preserved only in fading images that flatten memory into two dimensions. Christine continued these themes in her solo exhibition. 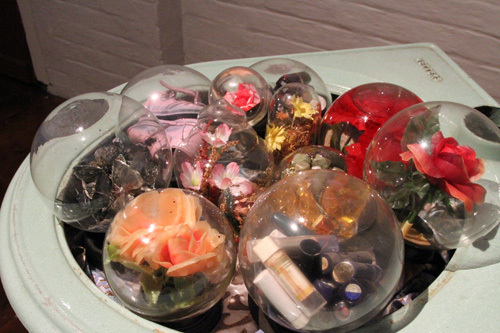 The copper bubbled up colourful detritus of womanhood from lipsticks, hairclips and compacts to baby shoes and flowers. 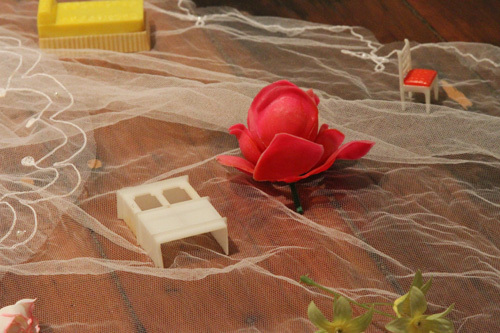 The washer was again transformed as a bridelike figure with a wispy net veil, but if one looked closely the veil decoration consisted of tiny objects of everyday domesticity interspersed with flowers. Wardrobes, chairs, beds and other domestic furniture reminded us of the reality behind ceremony and decorative effect and of the collection at Mavis Bank. An old stove from Mavis Bank collection, included in Christine’s solo exhibition was adorned with richly decorative biscuit tins, reminding us again of the importance of exterior appearances that may have little to do with the contents. Also on the stove a womans head, idealised with a tiara or halo made from old chandelier pieces. 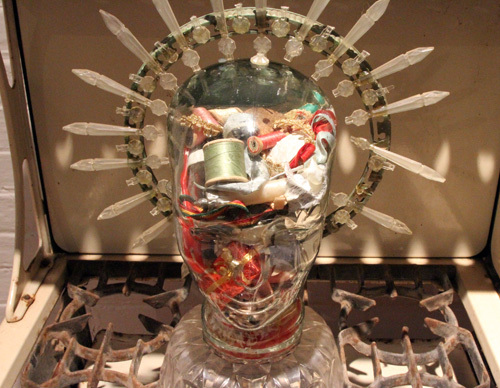 But this goddesses head is not filled with mystical or heavenly thoughts- just the everyday tasks of sewing and mending. The sorts of things mothers think about while they cook?